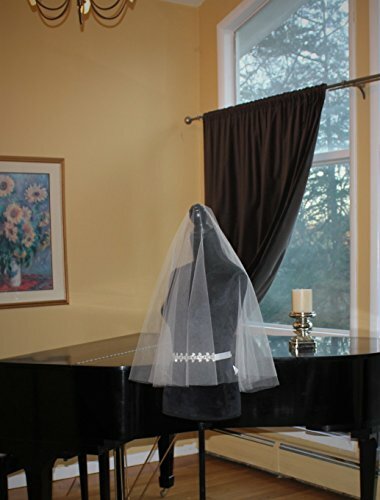 Drop Wedding Veil Modern oval shaped drop veil is made with a highest quality illusion tulle. Elegant and timeless raw edge veil will complete your bridal look with out competiing with the design of your dress. The comb is hand-sewn to the middle of the tulle, with no gather, to create a double layer veil and perfect draping. The veil pictured is shoulder length: blusher and back is 28" long. All other veils have 30" blusher and can be customized to a desired length in the back. The colors are white, soft white, ivory, and champagne. All my veils can be extensively customized in alternative lenght, gather/width, layering, trim and beading options. If you have any questions about this product by Art Veil Atelier, contact us by completing and submitting the form below. If you are looking for a specif part number, please include it with your message.